I think you'd find me at The Conservatory. I like the idea of Sony Studios right next door, maybe a bit of music ambiance influences the shop? Must check out the Conservatory on my next trip to the left coast! Wish I was going to make it out west so I could share some java with a certain two ladies before one of them head off to the empire! There are so many little hipster coffee shops in LA, it's overwhelming. I think I'd probably be at the Lost Souls Cafe, reminds me a bit of LA native Francesca Lia Block's Weetzie Bat books. Thanks for your comment. Cute coffee. thanks so much for your comment.youre such an darling! hope you had an great weekend. what did you do? That panda bear design just looks too cute to eat! Love that kind of creativity! You had me at fairy lights. I wish I was there - although getting coffee would probably be quite far down my list! The Conservatory for Coffee, Tea & Cocoa sounds amazing! Lost Souls is calling my name and it's so close to my work stomping grounds--(ha, pun not intended) anyway, I will bookmark this for my next downtown trip. Thank you! Oh the one with feed bags of beans...that sounds right up my alley. Such a wonderful post! I would go to both! but I think the Conservatory with the family owned business, beautiful latte art and a fine vanilla latte will get me. I visit L.A. quite often and put these cafe on the list. Lost Souls is one of the best cafes in Downtown LA. I discovered it through a friend when I was working in Downtown la. I was a frequent customer and the environment is very chill. I love their blended drinks especially the Cookie Monster! I'm going to keep track on all of these for when I visit the U.S, no joke! They all sound amazing. Also I don't know how I missed your last post, but it is all kinds of wonderful!! So detailed. I go wherever the mexican hot chocolate is. That is my favorite. No other cocoa compares. 27 lip glosses?! What a collection! Do you wear them all or are some forgotten? L.A. is my ideal place to go to a cafe. Perfect weather and people watching, what more do you need? I would love to go to all these places you've mentioned. Have a great week!! Oh, and I gave you an award on my blog. Check it out! ohhh I need to go to the one in Culver City!! The Conservatory sounds lovely! Thanks for doing some in LA, I'll have to check these out next time I'm over there. ooh I'll have to check out some of these coffee spots! Have you ever been to Aroma in Studio City. It's ridiculously popular and crowded on the weekends now but it's a cute neighborhood spot! They're also related to The Alcove in Los Feliz. 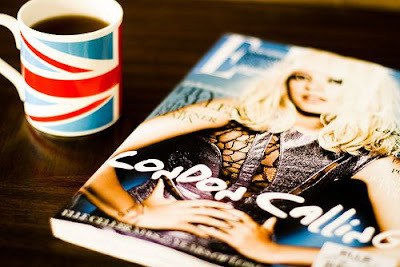 This post totally makes me want to curl up with a great cup of tea or hot chocolate and a great magazine! Let's just say that I need a cup o' panda. Please and thank you. Lost Souls Cafe sounds heavenly!! OH! I am feeling melancholic now. The conservatory was my friend´s Daniela favorite Coffee shop and we used to go there a lot. It was very closed to my how. Tiny but cute and with good coffee. Thanks for putting a smile in me. Did you get the package? So great post ! I adoore every pictures ! I wonder when we can have our coffee together? Thanks Erika for this cafe posting! I gotta try Lost Souls mainly becuz it's closer to Pasadena than CulverCity. Q: What do you recommend I order from there? thank you so much for dropping by my site love! yeah, too bad the contest is open only to the PI, as i do have readers elsewhere. :( oh and i love your blog! do you mind exchanging links? I am dying to go to LA one day! It seem slike such a beautiful place. The Lost Souls Cafe sounds amazing. I would love to see the grungy feel to it. Lost Souls Café is calling my name with the mention of crepes! 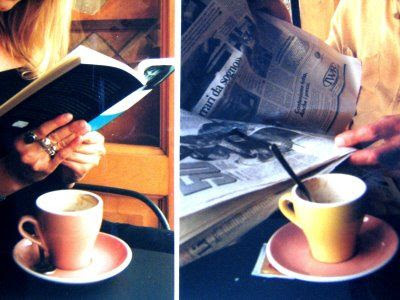 :) Loved this post, just so enticing and informative...who can resist cafes such as these? I have been to LA many many times when I lived in SoCal but never did I go to a cafe but now I know where to go! awesome, and that cup with the panda is so cute! Wow, love the selection and the panda face foam - aww! 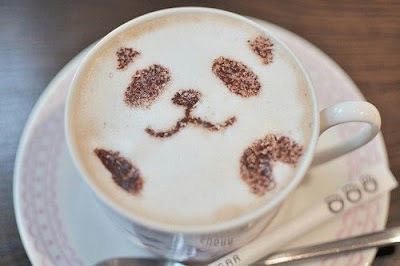 The panda coffee is very cute! I've actually never even been to California so it would be lovely to check out either place. But the Vanilla Latte at The Conservatory for Coffee, Tea & Cocoa sounds so delicious! loving the theme! i've always wanted to see LA, now i have the perfect reason! I will go to whichever one you will take me to - you are the Queen of the Coffee Bean houses, love!! As a LA gal myself, I need to check out more cafes! There is so much to explore that I haven't. I am way excited to check out new restaurants this week and next for dineLA! Mmmmm - sounds yummy but I'm too far away to check them out. It's cold here in WI, I need a hot tea or latte to warm me up! Great post! Really enjoying your blog!